Conventional government schemes and microfinance interventions have struggled to reach the poorest and help them escape the confines of extreme poverty. In response, BRAC, Bangladesh’s largest non-governmental organisation (NGO), developed an innovative approach that combined livelihood creation, financial services and safety nets in order to ‘graduate’ participants out of extreme poverty and toward a sustainable livelihood. Inspired by BRAC’s success, CGAP and the Ford Foundation launched an initiative to test and adapt BRAC’s approach in a diversity of countries and contexts through their Graduation Programme. 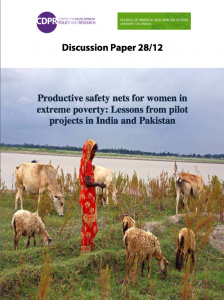 This paper focuses upon two Graduation Programme implementations – one by Trickle Up in West Bengal, India, and the other by Orangi Charitable Trust (OCT) in Sindh, Pakistan. We use the ‘critical moments’ framework developed in Kabeer (2008) to understand the conceptualisation of this project in response to a particular set of constraints (and opportunities), its translation into a concrete set of proposals for action, the implementation of these proposals, the monitoring and evaluation of the process of implementation, and finally, the utilisation of the lessons thus learnt. As a part of this process, we explain the way in which individual participants’ have experienced the Graduation programme – the extent to which they benefited, the extent to which it is not so clear, and the multitude of factors behind these dynamics.